Christ and his 12 disciples have just finished polishing off 8 platters of potato skins, 4 kegs of beer and 6 extra large thin crust pizzas. The bill has arrived and there is profound disagreement with regard to who owes what. 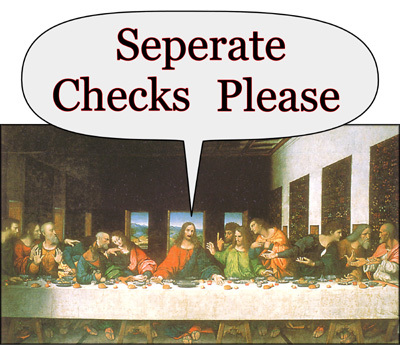 Jesus has become fed up with the bickering, and using the divine wisdom for which he was renowned, he decides to ask the waitress for seperate checks. Due to the immense difficulty of calculating seperate checks, as well as their rude and rowdy behavior, this group was no longer welcome at any of the area restaurants and thus this dinner was deemed "The Last Supper". Fortunately for the waitress, it was the policy with large stingy groups such as this, for the bill to already include the tip. Some scholars have suggested that the disciple on Jesus's right may actually be Mary Magdalene . If this were true then it seems likely, from what we know of Jesus's chivalrous nature, that he would have offered to pay for her portion of the bill.